26 June 2018, How amazing four years have flown by since I updated the blog! 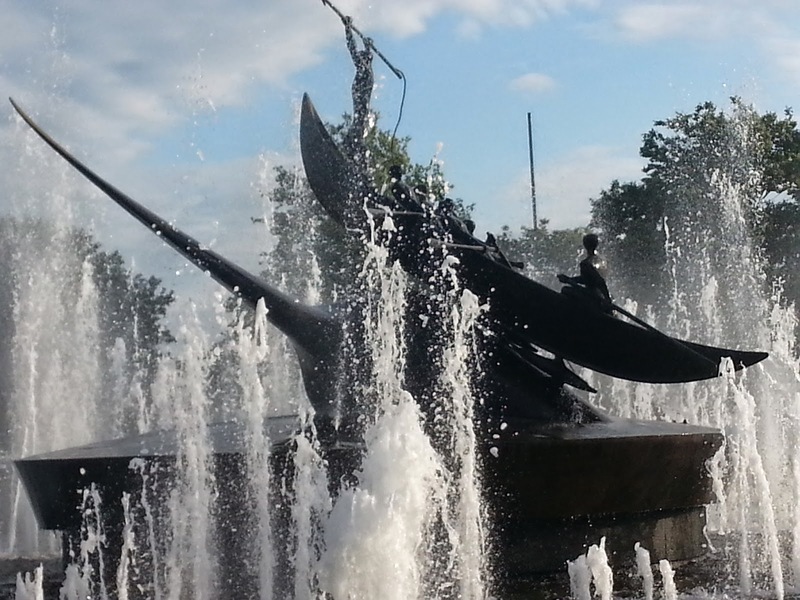 We were saddened to read Arne Brekke of Grand Forks, ND passed away because we so enjoyed our Brekke tour of Norway recommending it to many friends. 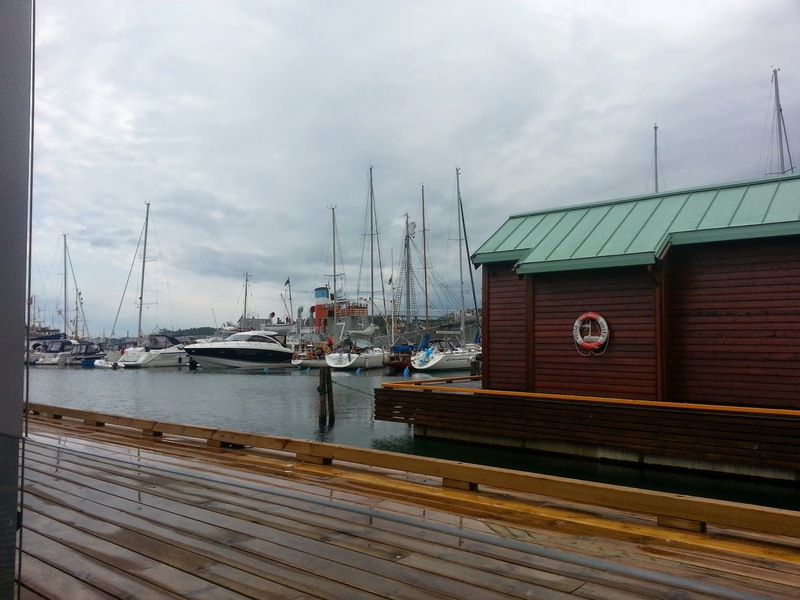 13 July - a few photos from Flaa, Norway yesterday and today. 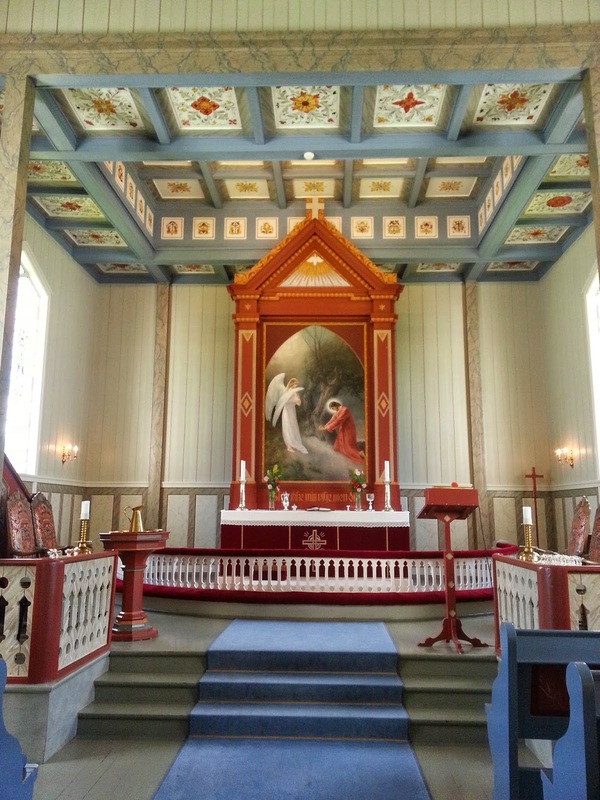 The interior of the church at Flaa is beautiful. We enjoyed visiting with the student pastor. The congregation no longer enjoys every Sunday worship; fortunately they had worship today. From there we drove to Stor Gandrud (the large Gandrud farm). I will edit more when time permits over the next few weeks in Norway. 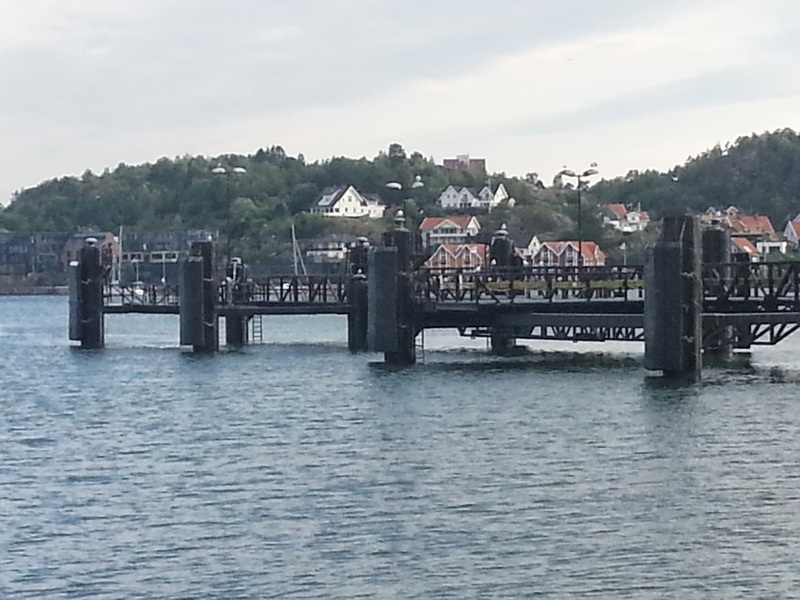 The last photos are from Sandefjord where we are spending the night before driving to Kristiansand. 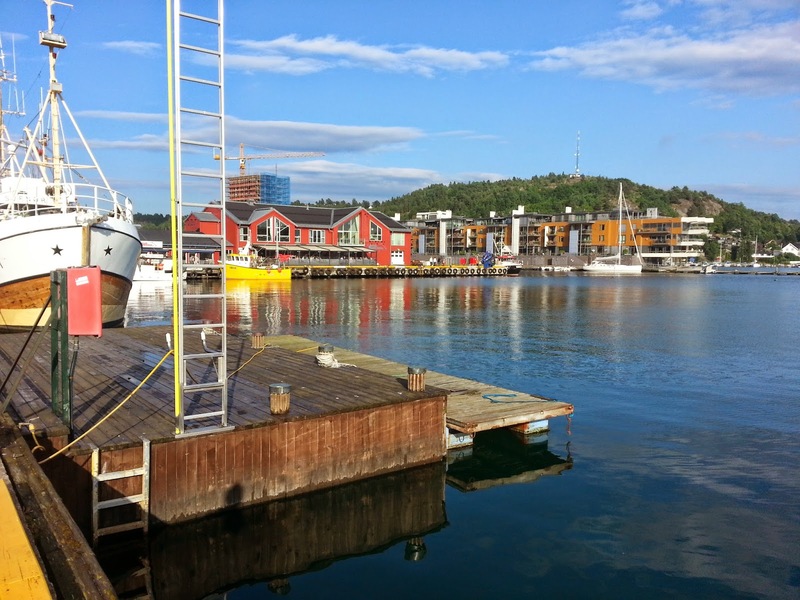 11 Juli- Oslo, Norway: The extremely, STRONG steward was sitting on the deck in a tee shirt as we watched the ship docking in Oslo; he laughed heartily when Ron complimented him on his superman strength in front of his comrades and enjoyed a later opportunity to tell him how distinguished he looked in his uniform. Ron generously tipped the steward that assisted us with our luggage to the taxi asking him to share with the other man. 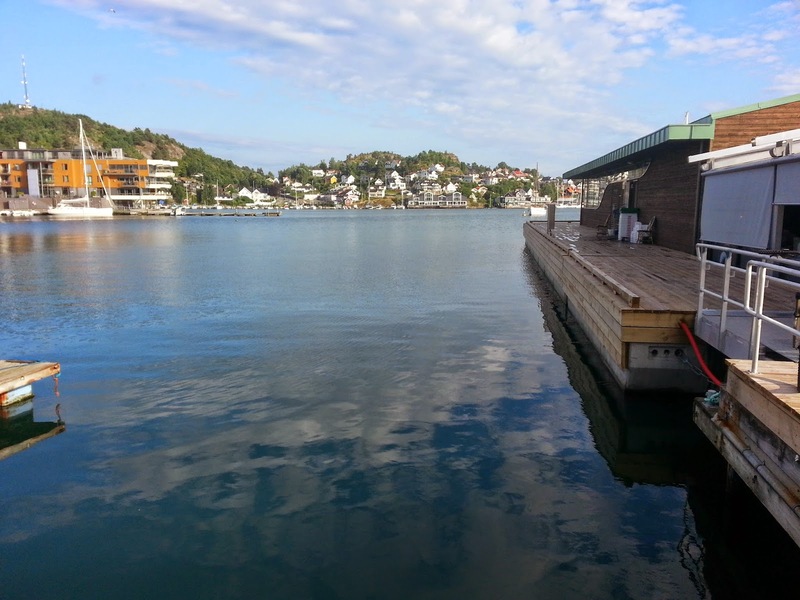 Our room at the Grand Hotel in Oslo was not ready when we arrived giving us the opportunity to take a short fjord cruise to the Viking Ship and the Kon-Tiki Museums. The pictures taken with the cell phone do not adequately tell the story of discovering the 1200 year old Viking ships or the decay that is happening from within the wood right now creating a current crisis. A desperate race is on to discover a way to preserve the ships and their treasure or this is the last generation to see them. The Viking ships were used as burial chambers for two women and one man; likely the woman was a queen or very wealthy person who was gifted with food, animals, utensils, etc. for her journey to "beyond." Fascinating to learn 15 more Viking ships have been discovered this past week exciting everyone with the new discovery. From the Viking ship museum we walked to the Kon-Tiki museum to view the bamboo and balsa raft constructed by Thor Heyerdahl and five other men in 1947. Some of the photos below are from the sunset last night and the rest were taken as we approached Oslo; the others are from the day's journey. We have an upgrade to our room, car rented for tomorrow's journey to Flaa, Norway. 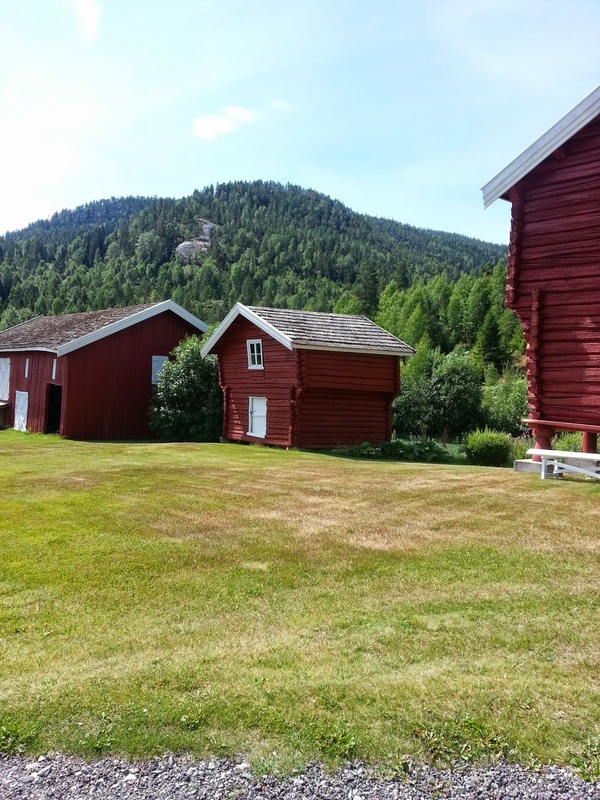 Thanks to Howard Gandrud for sending the photo of Stor (large) Gandrud farm he took while in Norway. Howard descends from the Vesle (small) Gandrud farm but he did meet Nils Kolbjorn Skinnes, a Stor Gandrud farm descendant and current owner. It may be that Vesle Gandrud farm is visible on the upper right side of this photo, but the large white house on the left is the Stor Gandrud farm. 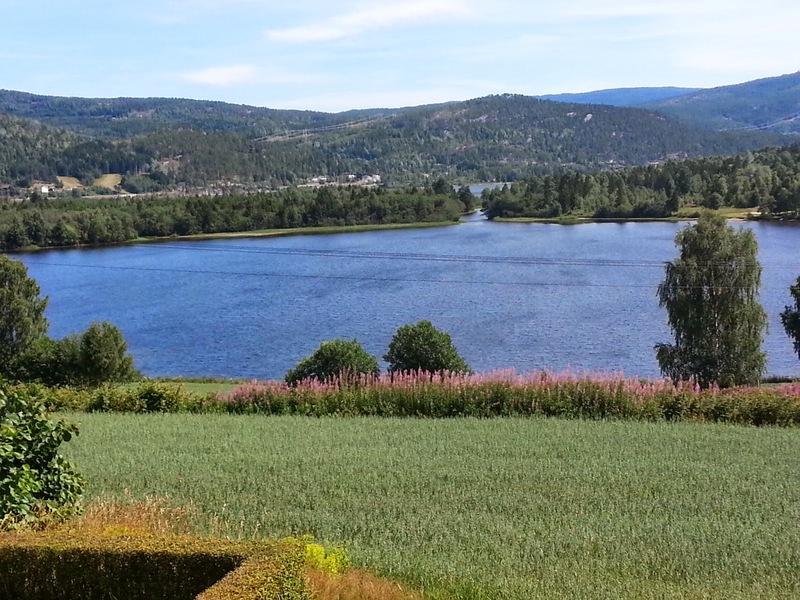 During the Second World War, the only site of actual armed battle between the Norwegian resistance and the Germans took place from the hills above the farm. The underground resistance shot down at a German U Boat in the lake; the U boat returned fire with some of the bullets lodging in the children's playhouse. The bullets are still in evidence in the playhouse. The book is in print at long last! 12 August 2009 - A brief update: My book, The Spirit in the South, is finally in print. If libraries request a copy from authorHOUSE they will receive one free. Email me and I will email the address for that request. After the long time-consuming process of writing, editing and proofing that began in 1999, it is finally finished. I am so grateful to Jane Bauer of Kensett, Iowa who is a phenomenal editor! This book could not have been completed without her amazing critique and assistance. She sees things I do not. Additional thanks goes to many cousins, especially Anne Curtis Terry who contributed essays to the book. The book is available on Barnes and Noble's website as well as Amazon.com. For the new reader of this blog: it helps to start reading the Hallinglag history from the first posting as opposed to going backwards by date. The history of Hallingdal makes a lot more sense if you do that. Maybe I should have written it backwards in time? I received some great photos from our cousin Danny Brunsvold of Kensett - Worth County, Iowa; plan to get them uploaded when the history of Hallingdal shifts to Worth County history of the immigrants. Danny and I share common ancestors: his ggrandmother Malena Vold Brunsvold and my grandfather were siblings. And Happy Birthday to Danny's mother: Marguerite Brunsvold! Feeling like a good Lutheran - guilt-ridden about not blogging for a month - I had to at least give a date when my travels will come to a halt. 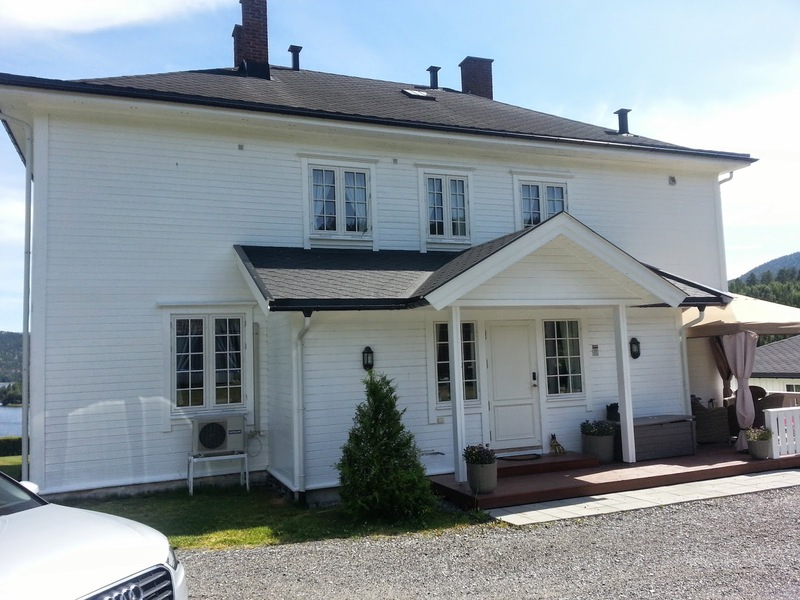 About the tenth of October I will have another segment on the history of Hallingdal and move forward with the journey of Norwegians to "Amerika." We returned from a trip to Worth County, Iowa and a class reunion. Too much fun! We also enjoyed a trip to Decorah in honor of our good friends, the Hermeiers, fiftieth wedding anniversary. The Iowa sweet corn was incredible - and so was our stay at the Johnson's log cabin. In the meantime and in-between time - I am headed to Virginia to do some research and exploring with my cousin. 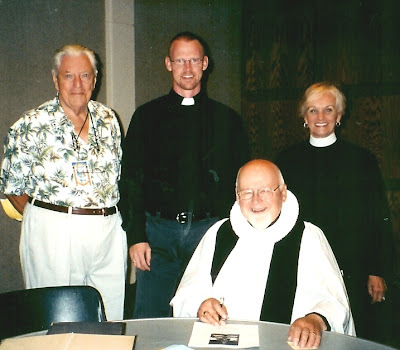 Pastor Arlen Fiske (seated) wearing an original Lutheran "ruff" collar and vestments. 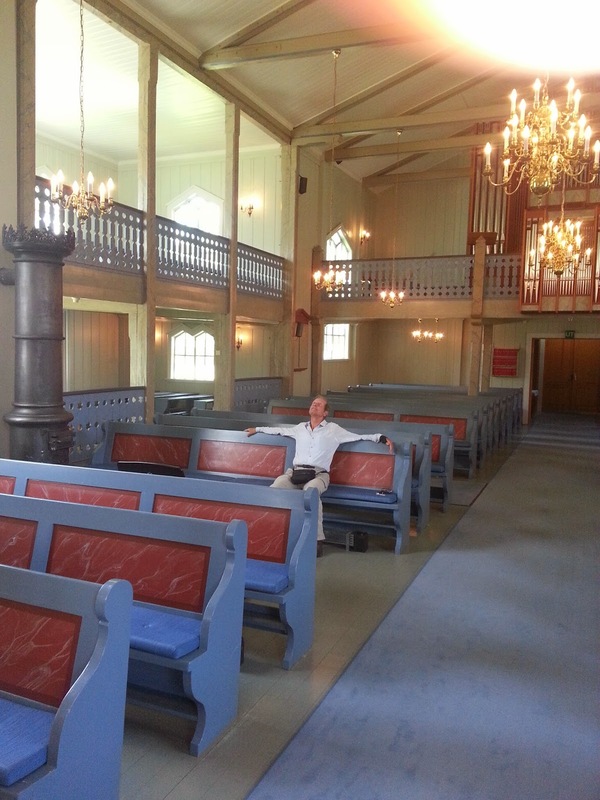 Pastor Fiske is the author of many novels about Norwegian life and customs. 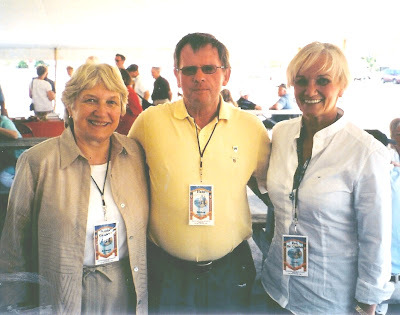 Krista Gandrud Sanda Johnson, Hans Bekken (Mayor of Flaa, NOR) and Cynthia under the big tent at Walcott, ND. This is the day Mayor Bekken became so sun-burned he had to be hospitalized upon his return to Norway. Krista's great grandfather Engebret and my great grandmother Brynhild were brother and sister, descendants of Stor Gandrud from Flaa, Norway. Mid-day in Walcott, ND we were treated to a wagon train showing us how our ancestors arrived in the midwest. 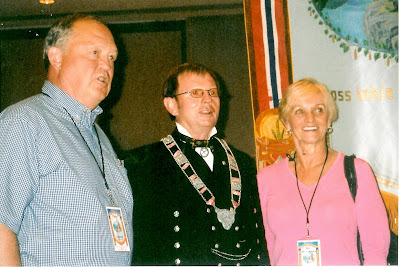 Peter Gandrud, Hans Bekken, (Mayor of Flaa, NOR) and Cynthia in front of the Hallinglag Banner. Moorhead, MN - 2007 (Krista Gandrud Sanda Johnson, Photographer). 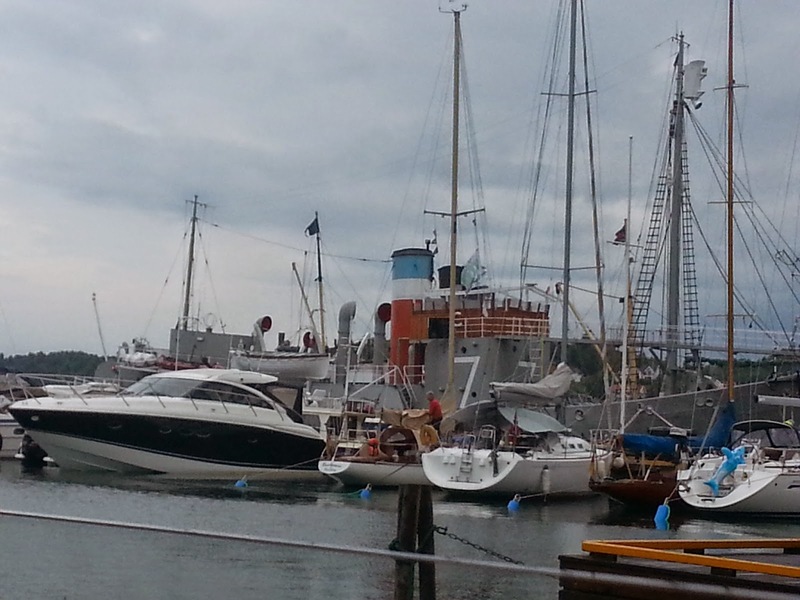 I will post more photos and information about the Stevne as the photos become available. Thanks, Krista! 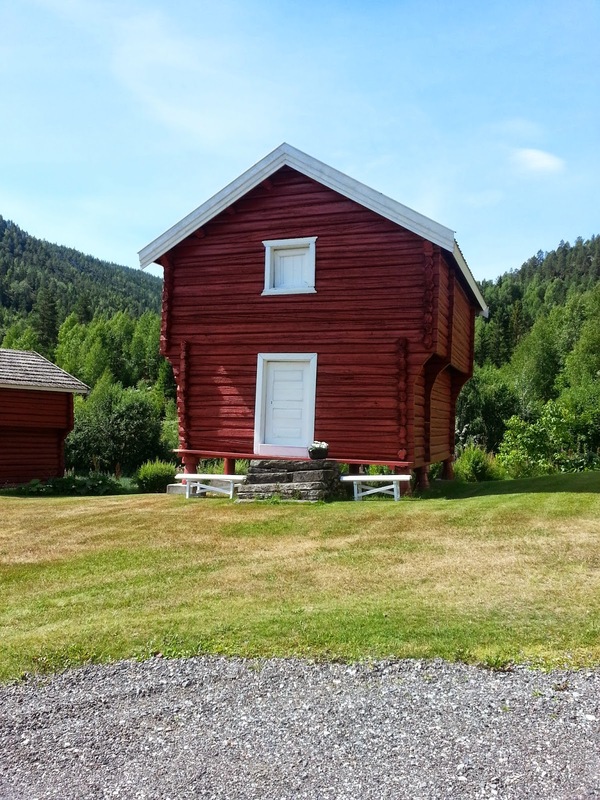 In the meantime, we will continue with the history of Hallingdal and begin to look at the reasons for the big Norwegian migration to America in the 19th century. 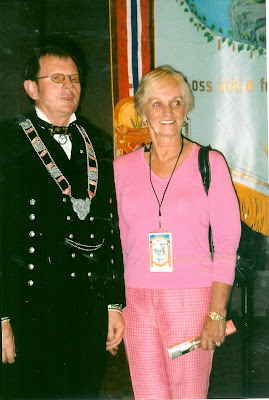 Hans Bekken, (Mayor of Flaa, Norway) and Cynthia - taken at the Centennial Stevne of the Hallinglag of America, Moorhead, MN - 2007. A Stevne is a meeting; the Hallinglag is an organization of descendants of Norwegians from Hallingdal, Norway. The Hallinglag began with a flourish in 1907 at Walcott, ND. We bussed from Moorhead to Walcott for a day that involved a tour of the historic district (two buildings). Now, I don't necessarily recommend Walcott as the most exciting place to tour - but it was a very memorable occasion. The mayor was a most congenial fellow - but he did not speak English. The next day I finally located a translator and learned he had been trying to ask me if I had attended the Gandrud family reunion in Norway. And, no, I had not. He knows our cousin Nils Kolbjorn Skinnes (see earlier blog photo of Cynthia and Kolbjorn in front of our gg grandfather's clock). It was so much fun to see the bunads and listen to the youth choir from Al, Norway. I enjoyed participating in worship on Sunday morning with Pastor Arlen Fiske and the youth pastor from Norway. We had a delightful moment when Pastor Fiske met the Norwegian youth pastor and said,"I understand you can read Norwegian?" The Norwegian pastor laughed so hard and so did I. 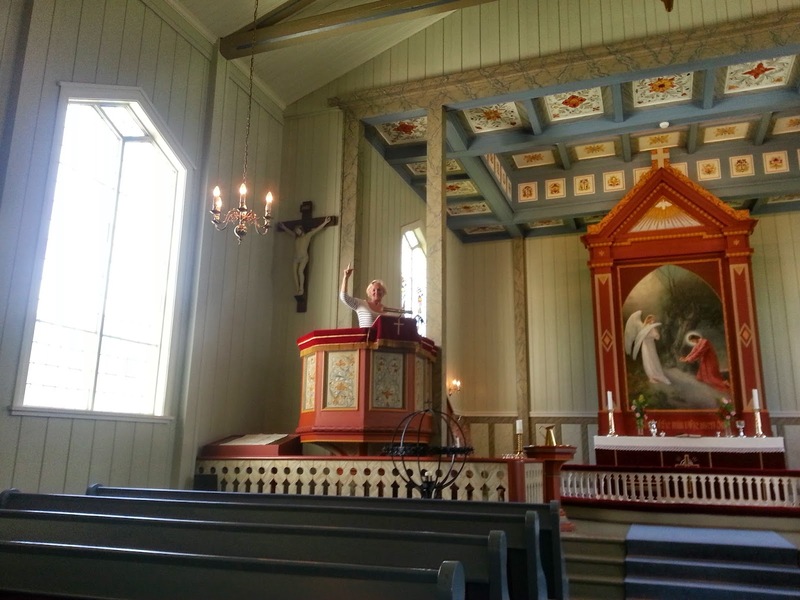 He was able to read the scriptures in Norse (because I could not do that part). 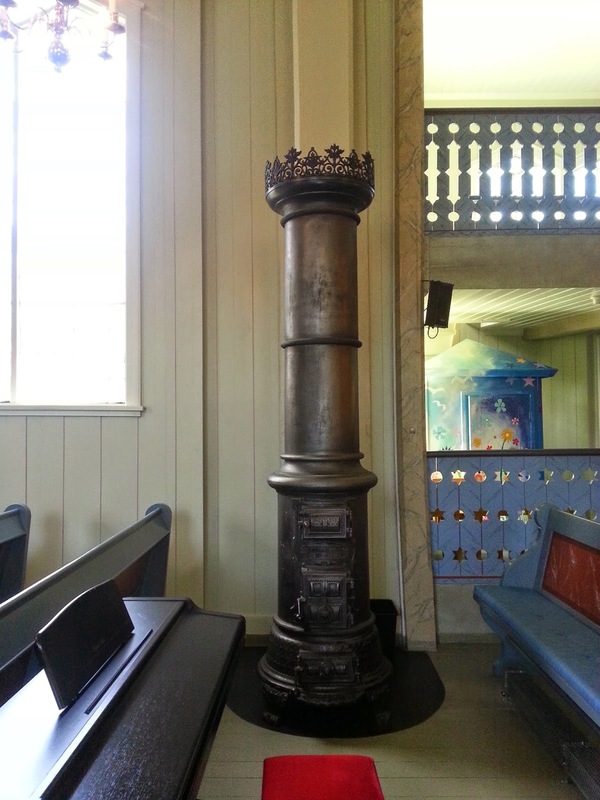 It was fun to learn about the way our immigrant ancestors worshipped using laypeople they called "Klokkers." One of my Vold ancestors in Norway was a Klokker - and now I know what that means. And if I look tired - it is because I was exhausted from lack of sleep. We stayed in dorm rooms at the Uof MN in Moorhead ... and the beds were likely castoffs from a Nazi Prisoner of War camp. Cousin Krista had a very rude awakening at five AM when her bed broke down. The best part of the trip was meeting Peter and Marilyn Gandrud and to spend so much time conversing with Cousin Krista! She is a delightful person. We are really "identical cousins!" A bunad is the Norwegian folk costume specific for each community down to the tiniest details; it is pronounced bunahh. This particular bunad is likely from Al and not Flaa. 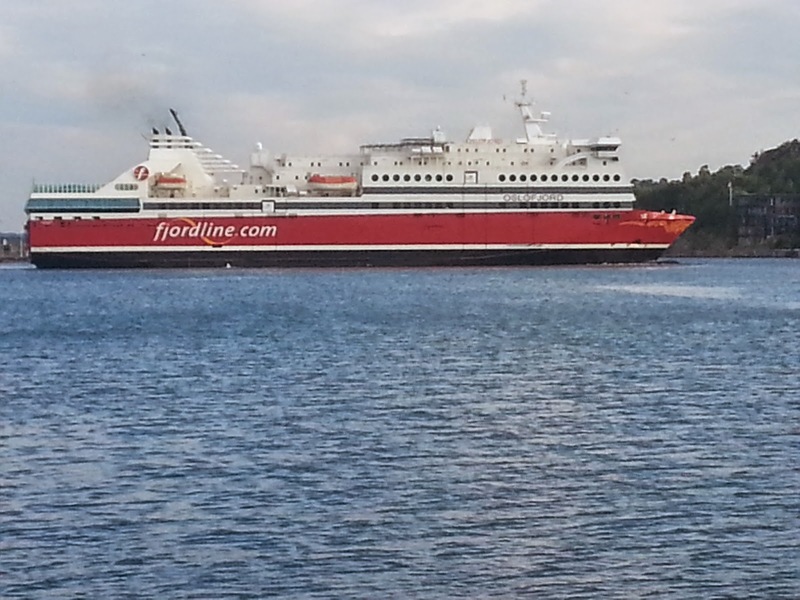 Flaa's bunad can be seen in the photo of Vis-Kari in an earlier post. But this one is similar. Each bunad is very intricate and costs several thousand dollars to create. The woolens must come from that particular vicinity, too. Even the jewelry is unique to each community. 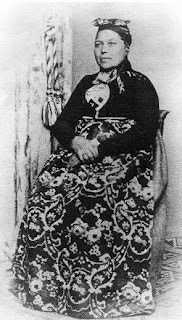 The folk costumes are colorful and practical; the women's can be "let out" for pregnancies - and in the case of this bunad, no one will notice the pregnancy for some months. The daytime bunad is belted and not so heavily embroidered. A set of keys hung from the waist belt of the day dress. Having spent almost four years of my life being pregnant - I am very certain that I would NOT want to wear this bunad - not even for a day! Good grief! The only way I would wear a bunad like this without the waist is by pasting a photo of my head on the picture. - which is exactly what I did! 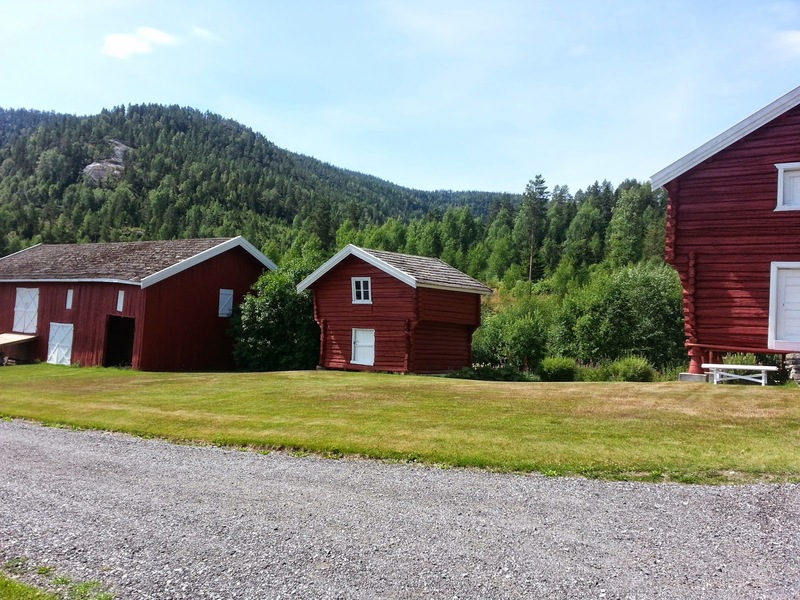 Edna Rude tells us, “From an old history book we find this description of life on a valley farm, whether in Hallingdal or elsewhere in Norway. Each “settlement” or community consisted of one “big” farm handed down through generations of one family since the beginning. 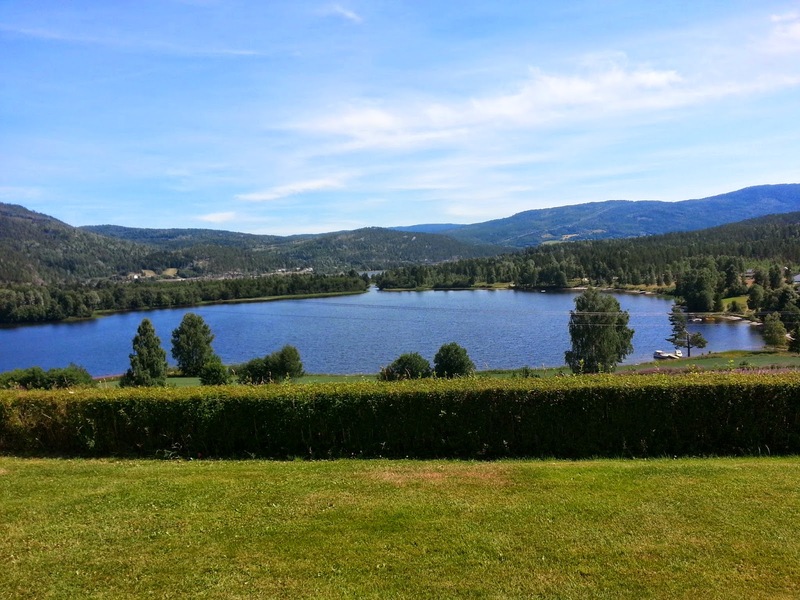 The location would be by a river, fjord, or tarn (lake). The owner was called “odelsbonde” or storbonde” meaning the big landowner. Because of his wealth he was automatically the leader in the community. Wealth was synonymous with wisdom! He kept armed body guards, many hired workers, plus some slaves. Near the buildings were pastures, fields and a small orchard. There was a garden containing cabbages, onions and plants used for dyes-blue, gold, etc. The whole farm was enclosed in a fence. There were many buildings on the main farm, all built of logs so large it took just three stacked on t op of each other for each wall. As there was no foundation the first log was laid directly on the ground, and each log was “slabbed” on two sides so walls were flat down inside and outside. The roofs were laid with planks, covered by birch bark (which never rots) and then sod on top of this. If the grass grew too long on the roof it was the privilege of one of the goats to be placed up there to nibble it down. Chimneys were unknown until the 18th or 19th century. The main house was long and narrow with a packed earth floor that had been excavated so it was lower than ground level. People would step down into the house. A ledge of earth was left around the walls and this was covered with planks so there were benches for seating many people all around. Two or three stone hearths were lined up along the middle of the room. A hole in the roof served to relieve the room of some of the smoke. The hole served as a window for light during the day. There we no other windows. And there was a sort of trap door attached to a pole so the opening could be closed during bad weather and darkness. Heavy crossbeams held the building together. One end of the house was divided into two small rooms, an entry and a storage room for food supplies. This was a forerunner of the kitchen. And in the entrance was a ladder to the sleeping loft above the storage room. There were, of course, many other building separate stables for cows, sheep and goats, a “stabbur” (storage) with sleeping loft above for the hired girls to sleep. Other help usually slept in the horse stable. 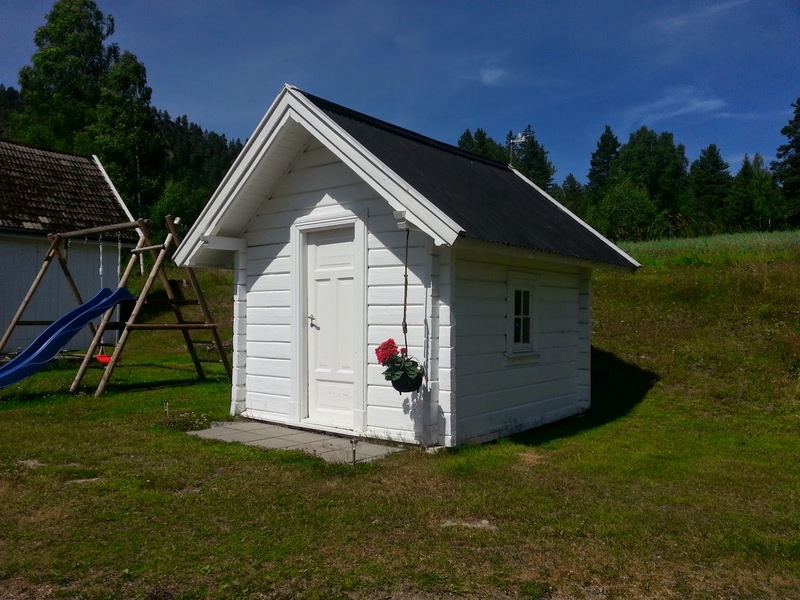 There was also a blacksmith shop, a boats shed and a type of sauna used every Saturday by the men. This practice continued until about 1800 AD.” (pp. 2-3, People’s History of the Hallinglag of America 1907-2007). 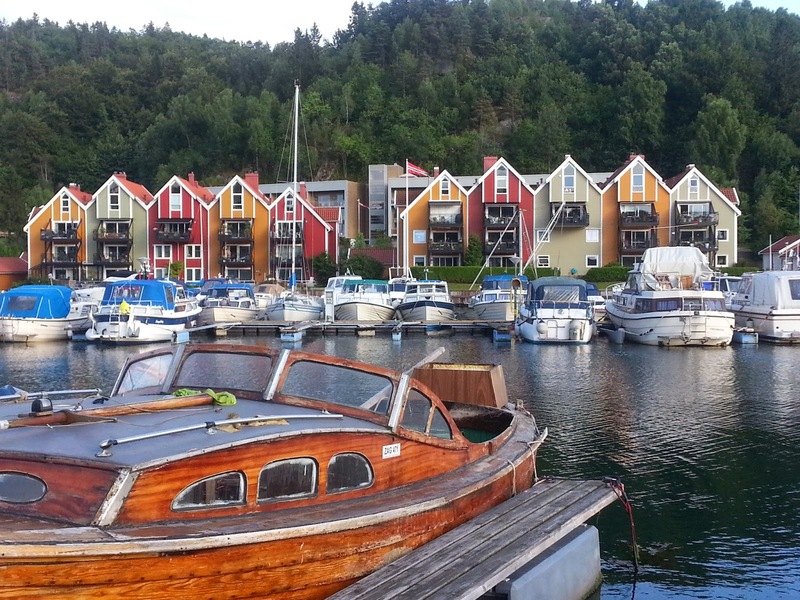 There are six communities in Hallingdal: Al, Hol, Gol, Hemsedal, Flaa and Nes. Edna Rude tells us that the earliest settlers around Al and Hol came over the mountains from the Sognefjord and Hardanger areas. They had followed ancient trails made by earlier migrant hunters. Gol and Hemsedal were occupied by those coming through Valdres and from the east (Sweden). It is not known if they had ever settled in Sweden or were just passing through. Nes and Flaa were taken over by people coming through Denmark and Estonia, taking the water route to Drammen and up the Hallingdal River. All of the above people spoke a similar Germanic (teutonic) language. They either lived peaceably next to each other or they fought to determine boundaries because they stayed. Yet, Edna says, to this day they admit a difference in speech, customs, actions and appearance. There is a distinct line between Nes and Gol. 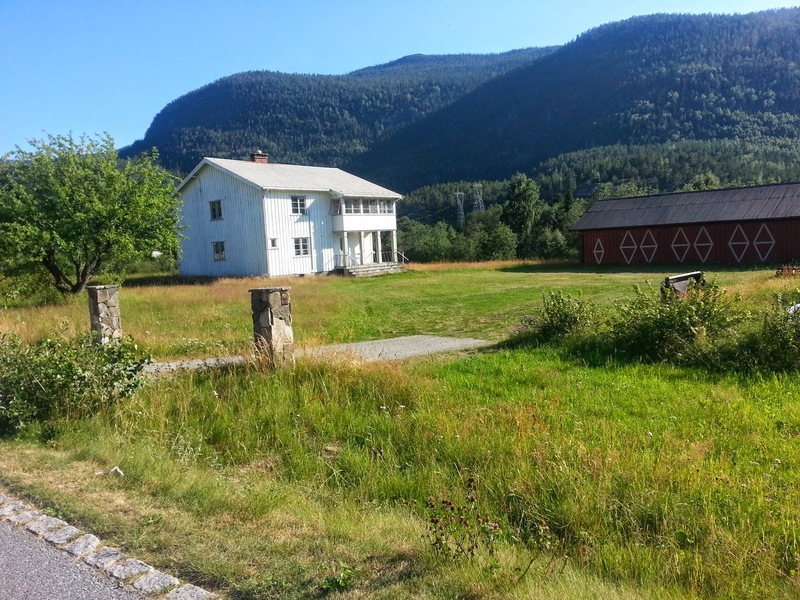 The people of Hallingdal were farmers with enough livestock to carve out their own existence. During the summers they followed the green grass high up on the mountains to a portion of their farm called the seter. Here the women (get that!) turned the herds loose and stayed with them. They made the finest butter and cheese from the milk up there as the grass was so very sweet and nourishing. Some summers the animals had to be carried out of the dark stable to eat the grass around the stable to gain the strength to walk up to the seter. They tried to keep too many animals on too little food during the winter for many centuries. Going to the seter was like a vacation. The air was so light and the sun shone more hours in the day than down between the mountain walls of the valley farms. They lived in primitive shelters in the seter and the hard work required strong bodies and strong wills. I just returned from attending the Centennial celebration of the Hallinglag in America. A Lag is a society or organization of Norwegian descendants of Hallingdal, Norway. More will be posted on the celebration later; but first I want to share some of the history of Hallingdal that I learned for the first time, thanks to Edna Rude and the mayors from Norway. 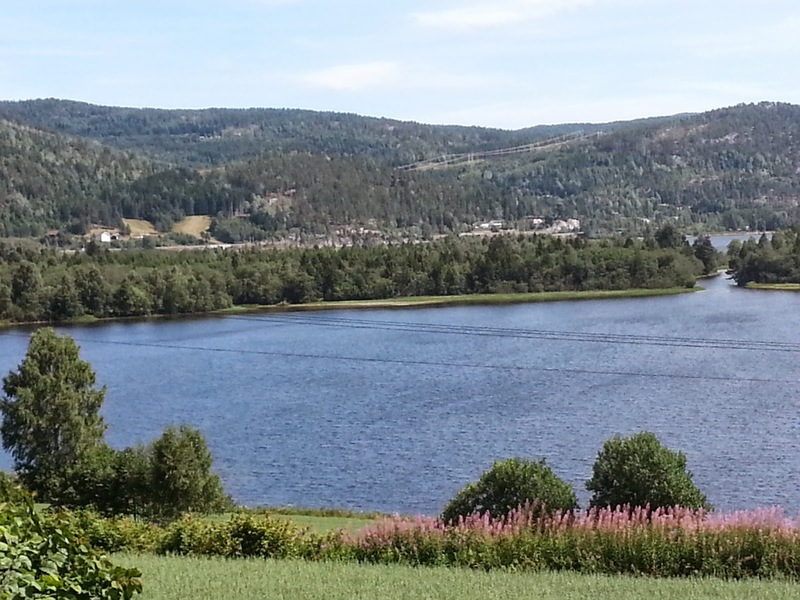 Hallingdal first became a kingdom about 800 and its first king was named “Hadding.” He lived at Hoff in upper Al and his son succeeded him as king, living at Garnos in Nes. The name Haddingdal was used for a long period before it became “Hallingdal.” Hadding was the son of King Raum of Telemark, and a brother of King Ring of Ringerike. In 870, Hallingdal accepted Harald Fairhair as king, along with all of Norway. So the history of our people begins with the civilization of a settled people, from about 800 to 1000 A.D. known as the Viking Age. While the Vikings raped and pillaged Europe’s coasts, they also planted colonies. Nobody was safe from the Vikings. The name Vik means bay or inlet and the men who swarmed out of these bays in the far north included Danes and Swedes and they were since known as Vikings. A king in France invited a group of Vikings to settle on their shores in exchange for peace and a guarantee that the Vikings would protect France from other bands of Vikings. That area is called Normandy; and it has been said that Normandy is the only place in the world where French is spoken with a Norwegian accent. 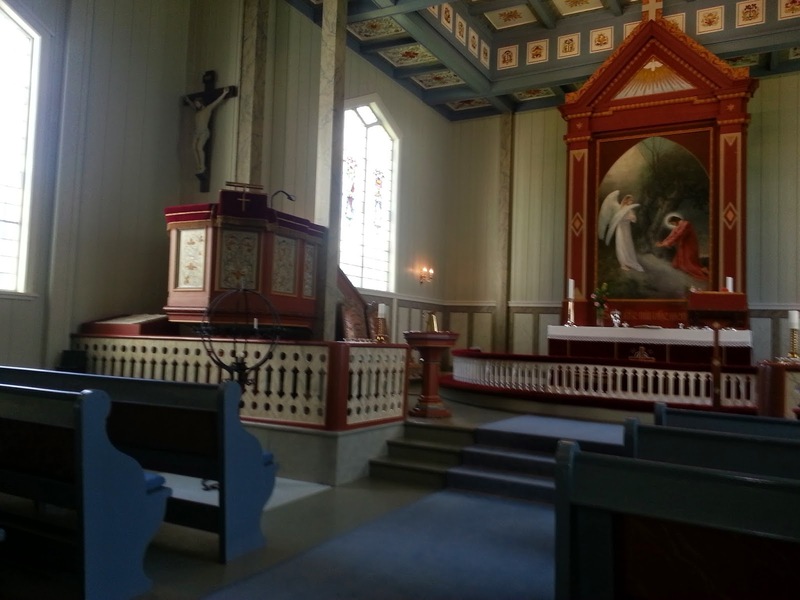 A large oil painting of Kari Pedersdatter (of Sevre) hangs in the narthex of the church in Flaa (mid-19th century). How cool is that? One normally finds paintings displayed in a church narthex of Jesus in the Garden or with the little children. It is indeed compelling because Vis-Kari (Wise Kari) was not only, God Forbid, a female, but she was a lay preacher even to kings, long before it was acceptable for such unheard of practices. Her preaching brought about great religious fervor against the backdrop of the Pietistic Haugean lay movement that swept Scandinavia. Kari spoke out strongly against the use of alcohol and such frivolities as music and dancing. But the tale gets stranger still: Kari was called Vis or Wise because she was a mystic: Norway's only known mystic. Kari had "spells." When she awoke from one of her spells or unconscious periods, she spoke of visions. And the crowds became quiet; they listened to words speaking truths that they were were not accustomed to hearing. Hundreds of men (get that????) obeyed her call to give up drink and to burn their musical instruments. Reading about Vis-Kari brings to mind mystics ranging from Hildegarde of Bingen, St. Teresa, St. John of the Cross - to Dag Hammerskjold, one of our modern day mystics. What exactly is the definition of a mystic? Wikipedia: "A mystic is one who believes in the existence of realities beyond human comprehension." I suppose the same can be said for schizophrenics. Not all mystics have visions either; some speak of an existential experience of the immanent or transcendent God that is life-transforming; yet, words fail them as they try to describe an encounter with "Something." They don't hear words or see visions, but they comprehend and grasp the deeper realities of God's presence among us in wondrous ways. 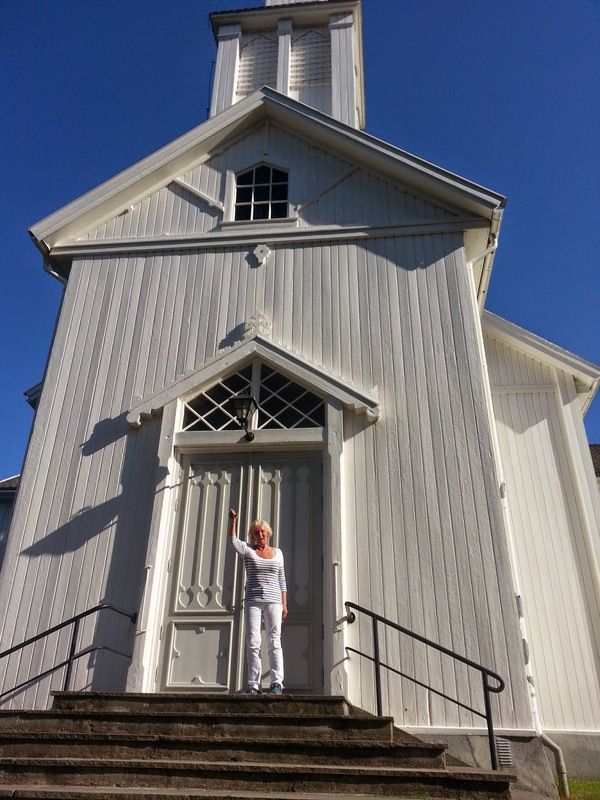 Kari's story is intriguing to me as a Lutheran clergywoman who witnessed the difficulties women faced entering ministry in the first ten years following the ordination of women in the Lutheran Church. Yet, here is an uneducated farmer's daughter who experiences "call" to ministry over a hundred years earlier than the ordination of women in the US and she is not only accepted, but she walks hundreds of miles to preach to the king, and he not only receives her, but he listens to her. She preaches to men and they obey as though God Almighty was speaking directly to them. She has visions at a time it was certainly not politically correct to hear from God apart from the written word (in Norwegian). And the people are so amazed they call her Vis-Kari. Who can help but stand in awe and wonder at the mystery of God using a young woman to bring such changes? 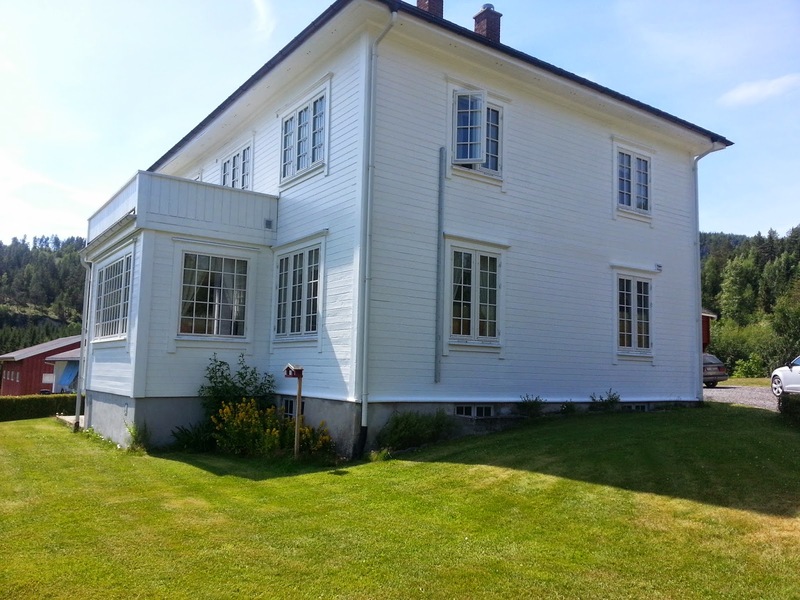 Vis-Kari lived at the same time and in the same place as my great grandmother, Brynhild Engebretsdatter; no doubt they knew each other because Brynhild's aunt Kristi was Kari's stepmother. She was a Sevre - as was her mother-in-law, Anne Olsdtr. Sevre/Sefre. While I cannot agree that her fervor against dancing or burning musical instruments was the Word of the Lord- I can rejoice to see her image displayed in the church at Flaa knowing she was a community treasure. 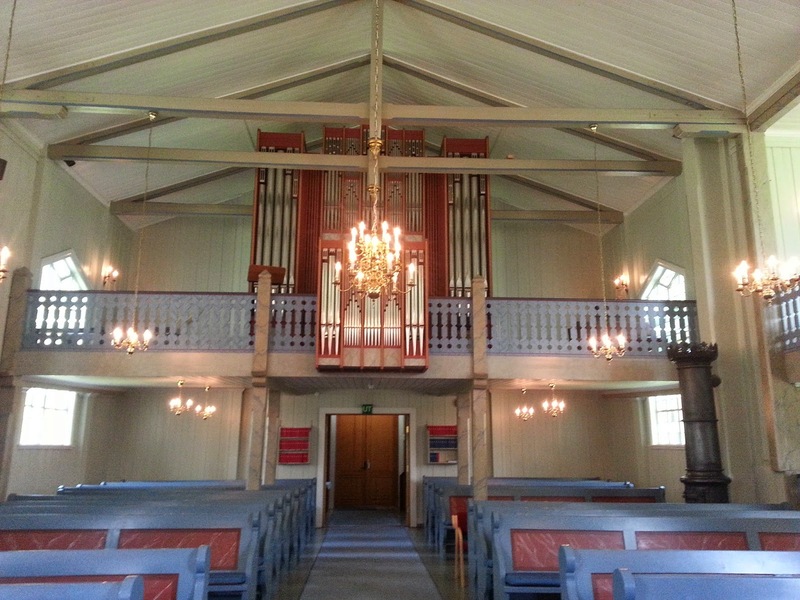 The church of Flaa, Norway was built about 1859 to replace the old Stave Church. The Vold farm is across the road - about where the photographer was standing. 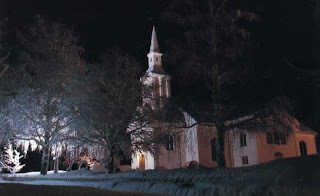 In 1860, Ole Halgrimsen walked across the road to make his vows to Brynhild Engebretsdatter. In May of 1861, Ole and his bride of one year got the "Amerika Fever." 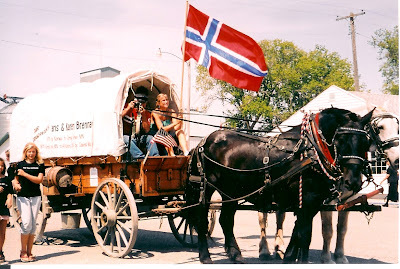 Ole sold the Vold gaard and set sail for America to join three of his siblings, Margit, Truls and Sever, who were already in Rice County, Minnesota. 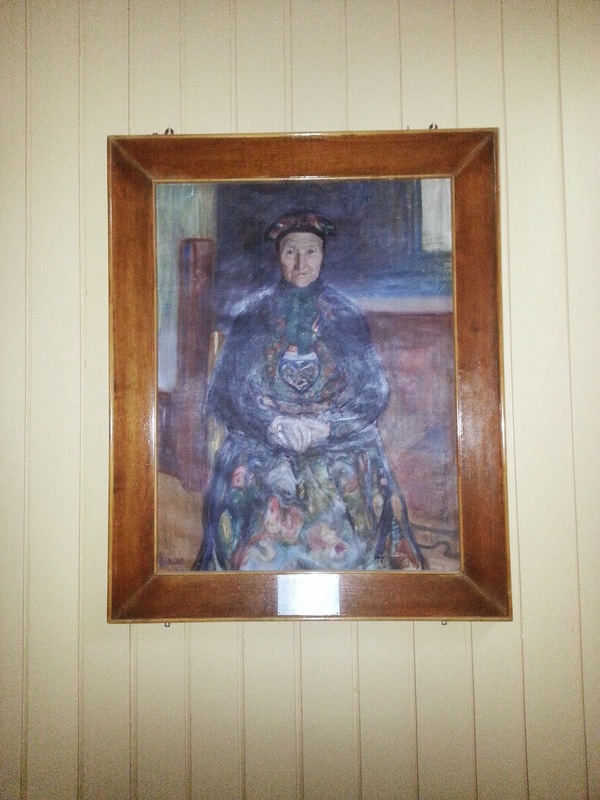 Ragnild stayed behind in Norway. For me, it was an exciting moment to step into the high pulpit of this church and imagine the mixed pride and horror that my great grandparents would have felt knowing their great granddaughter was a member of the clergy. 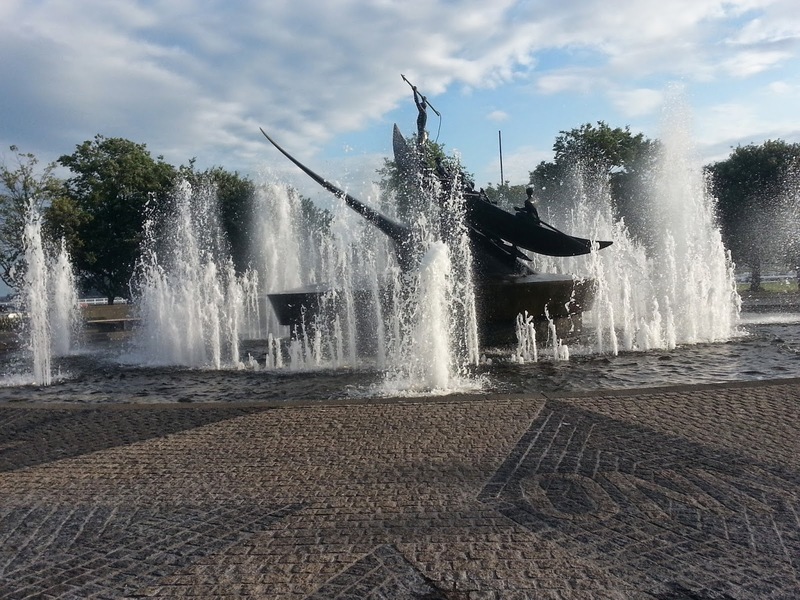 Ole and Brynhild set sail out of Drammen, Norway in May on the ship, Flora, bound for London and then embarking onto Quebec, Canada where they landed in August. They journeyed onto Wisconsin for supplies and prepared to move by covered wagon to Rice County, Minnesota near Nerstrand where they farmed for eleven years before settling permanently in Worth County, Iowa. 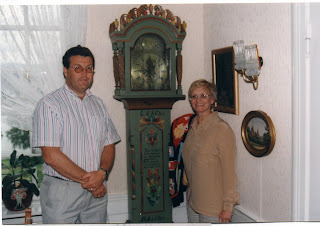 1996 photo of cousin Nils Kolbjorn Skinnes and me (Cynthia) taken in front of the grandfather clock that has been in the house and family since 1837. 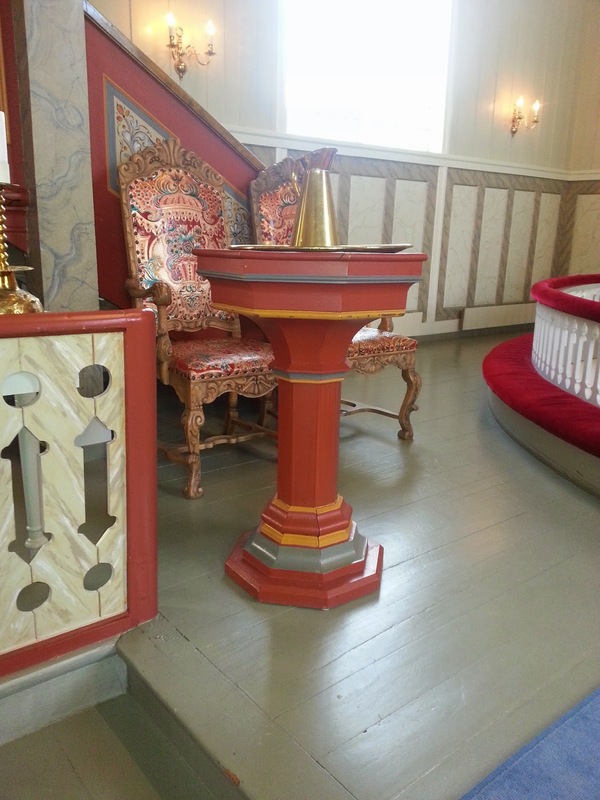 The clock belonged to our shared ancestors Engebret Kolbjornson Gandrud and his wife, Gunhild Knudsdatter Hilde. 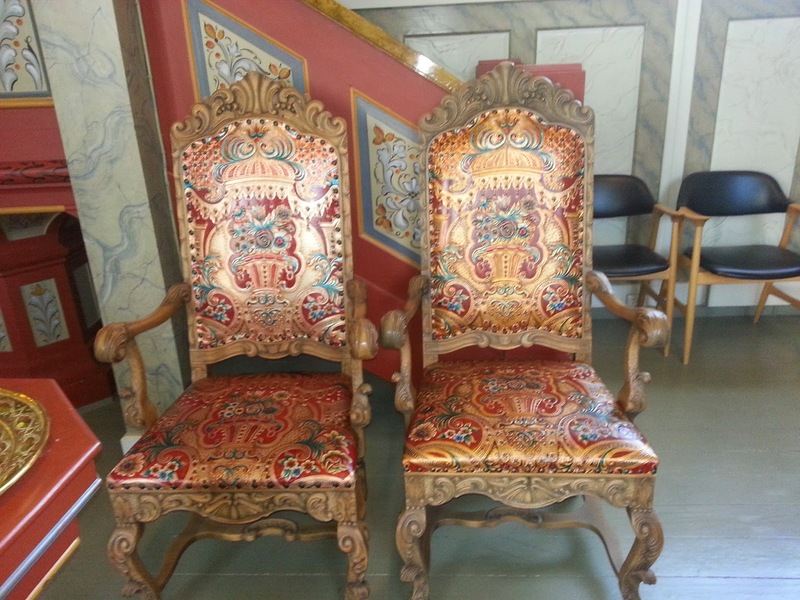 I had the clock reproduced in Norway by a master woodcarver and a rosemaling artist. Photos of my clock will be on the blog later. 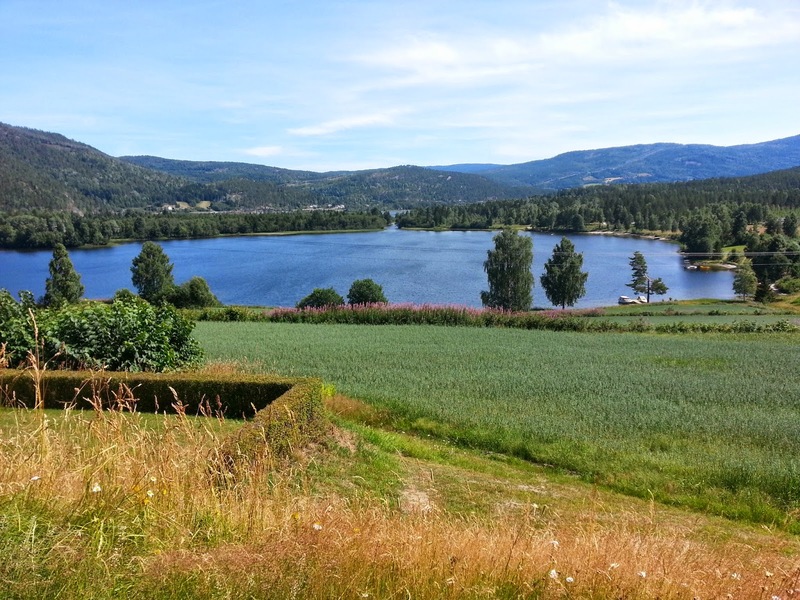 The photo of the Stor Gandrud lake view was taken in 1996 by Cynthia standing in front of the Gandrud farmstead facing the lake.